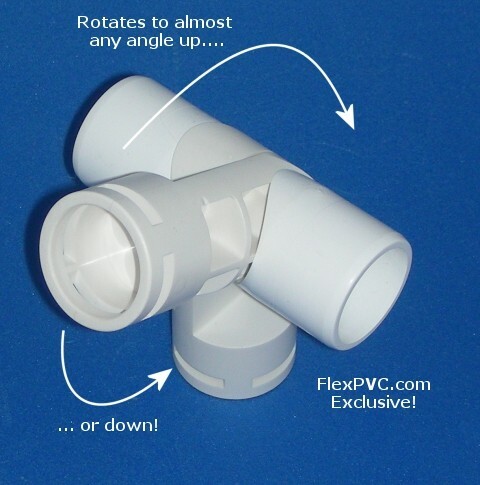 Any angle, furniture grade, (UV protected) 1" 4 ways, "pvc side outlet T's." Slip all four ways. Used for many construction projects, obviously not a flow through fitting. Bolt goes thru the middle that you loosen, set the angle and then re-tighten it. Comes with STAINLESS STEEL hardware (bolt, lock washer and lock nut.) 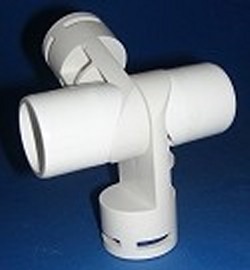 Works with 1" pipe, but you can also use it with 1.25" pipe with a couple, but it's a loose fit. Click here for an additional view. Works well with our any angle side outlet 90's, aka variable angle corner fittings.